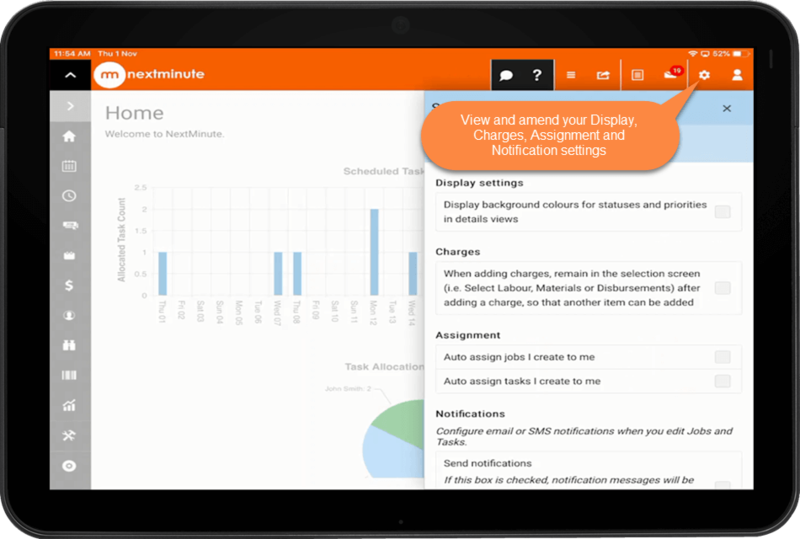 NextMinute menu overview - iPad – Welcome to the NextMinute support and feedback centre. 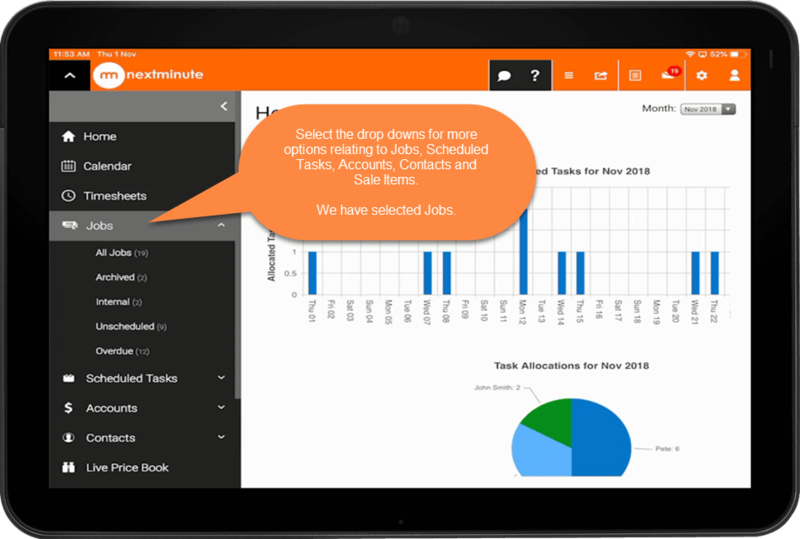 In this article we will take you through how NextMinute looks on a tablet and what is available under each menu. 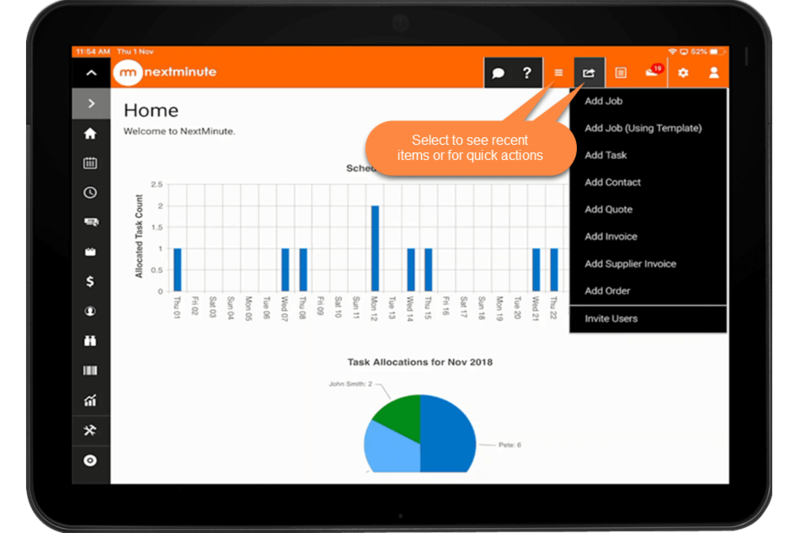 NextMinute on tablet looks very much like how it looks on a desktop. 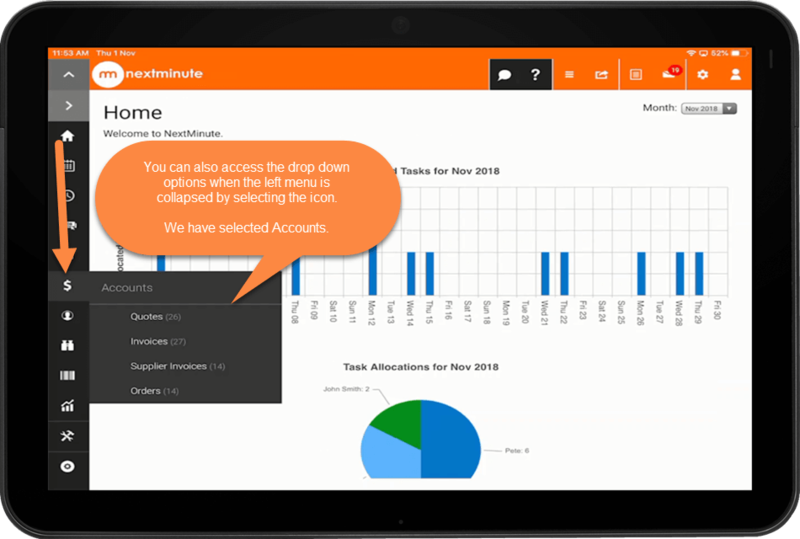 You can download NextMinute to your tablet via the App store or Google Play. You can have the top and left hand menu expanded, as shown below. You can collapse or expand both or have one expanded and one collapsed. Clicking each arrow has collapsed both menus. 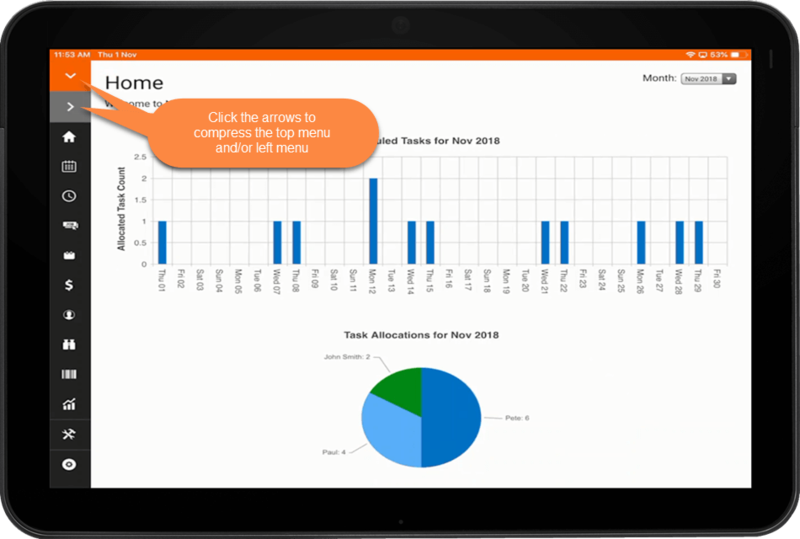 When the left hand menu is collapsed you can select the icon to see the options for that area of NextMinute. As shown below we have selected the Accounts icon. 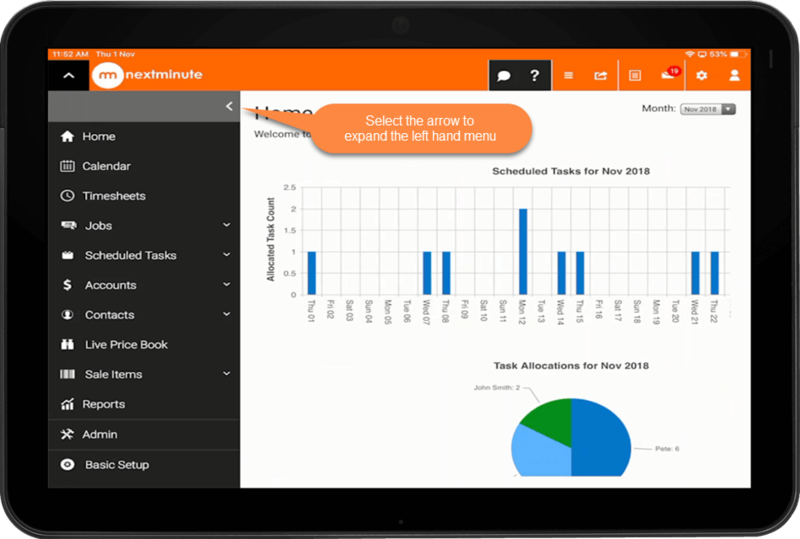 When the left hand menu is expanded you can select to see the options for that area of NextMinute as a drop down menu. As shown below we have selected the Jobs. 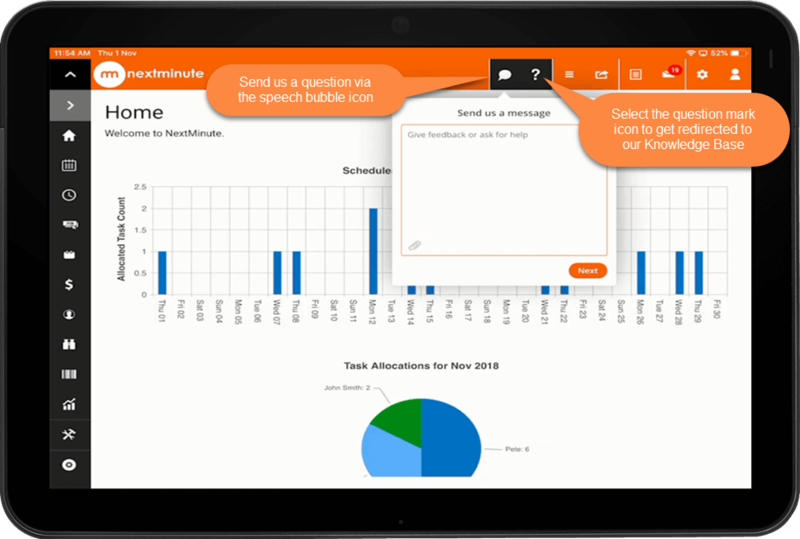 The speech bubble allows you to send a question through to NextMinute support, you can also add screenshots of the page you need help with. The question mark takes you through to our online Knowledge Base. The three horizontal lines show recent items you have accessed (Jobs, Tasks & Contacts) and the box and arrow shows quick actions, as shown below. The next icon is your activity log, as shown below. 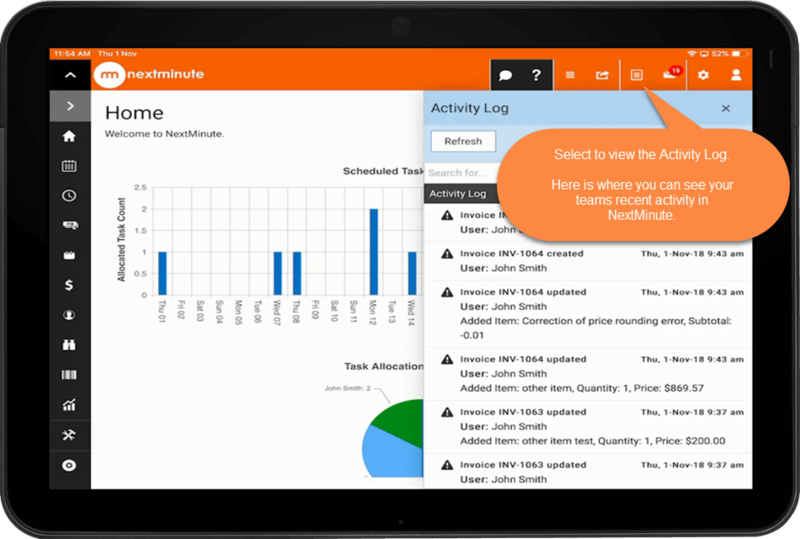 Here you can see all the recent activity within NextMinute, if you have an Admin role you will be able to see all users activity. The envelope icon is your Message box. 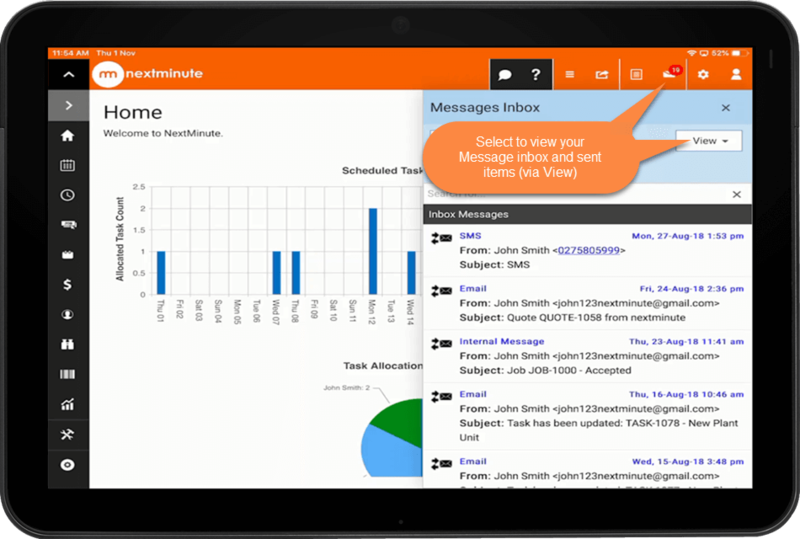 Here you can see all messages you have sent and received from NextMinute. The cog icon is your settings within NextMinute. Finally we have the person icon which holds all of your Account/subscription details. 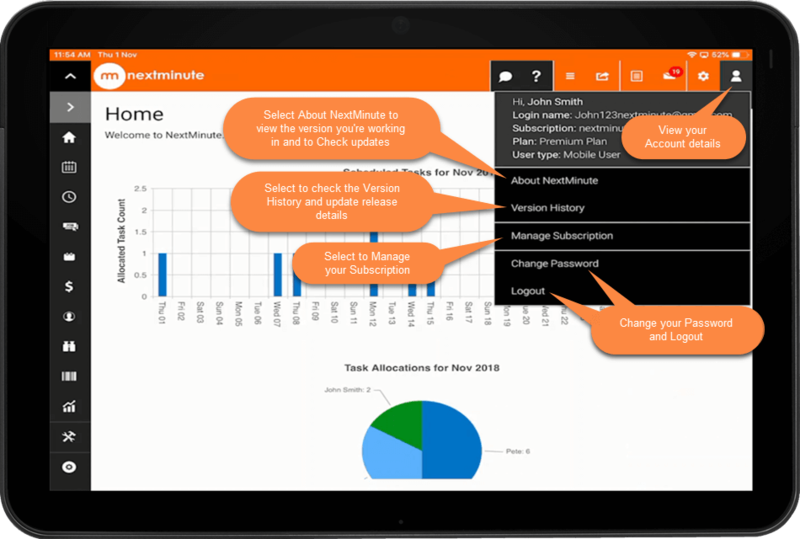 See the screenshots below for About NextMinute, Version History and Manage Subscription. 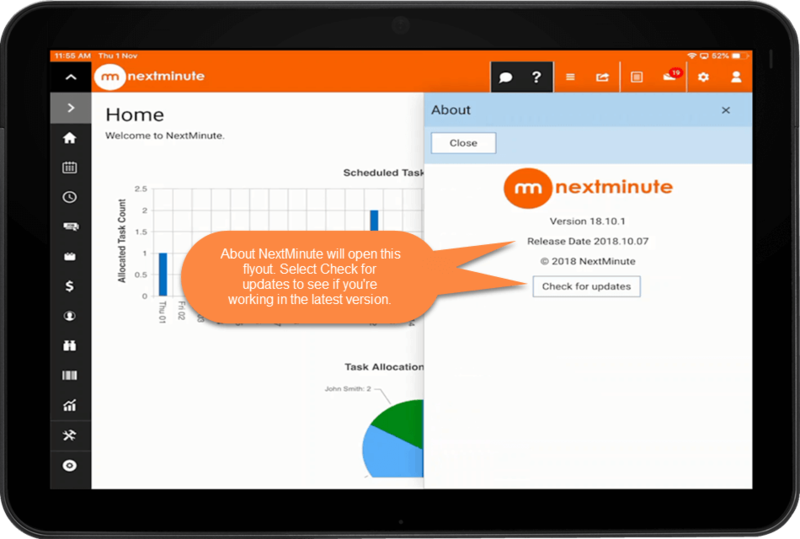 Here you can see the version of NextMinute you are working in and check for updates. 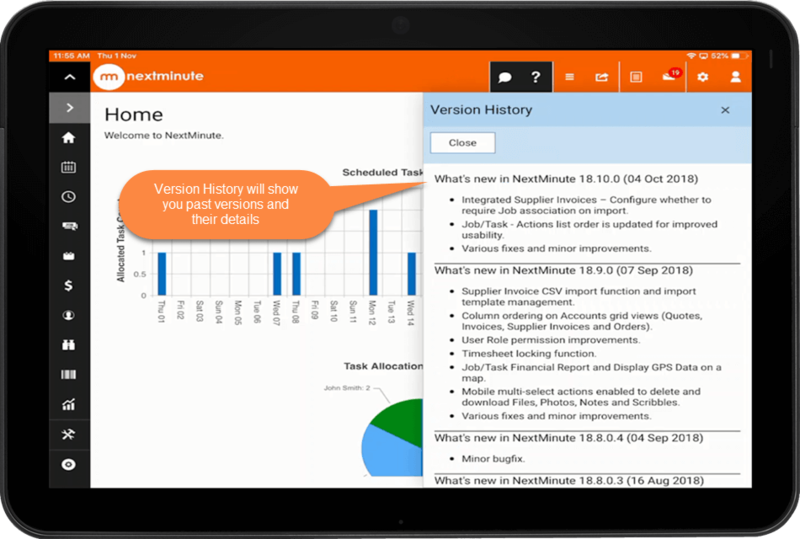 Each release is allocated a version number and can be found, along with what was fixed and what features and enhancements were included in that release, under version history. 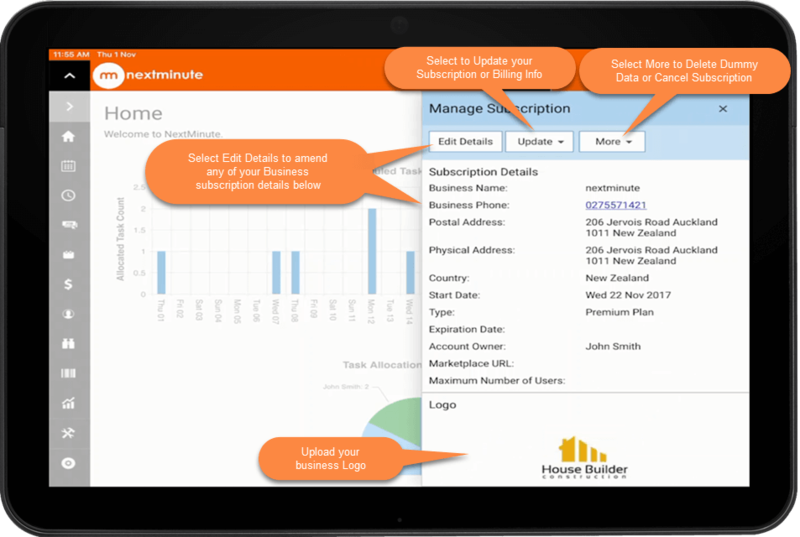 Here you can view and edit your subscription details, update your account (add or remove users), cancel subscription and delete dummy data.